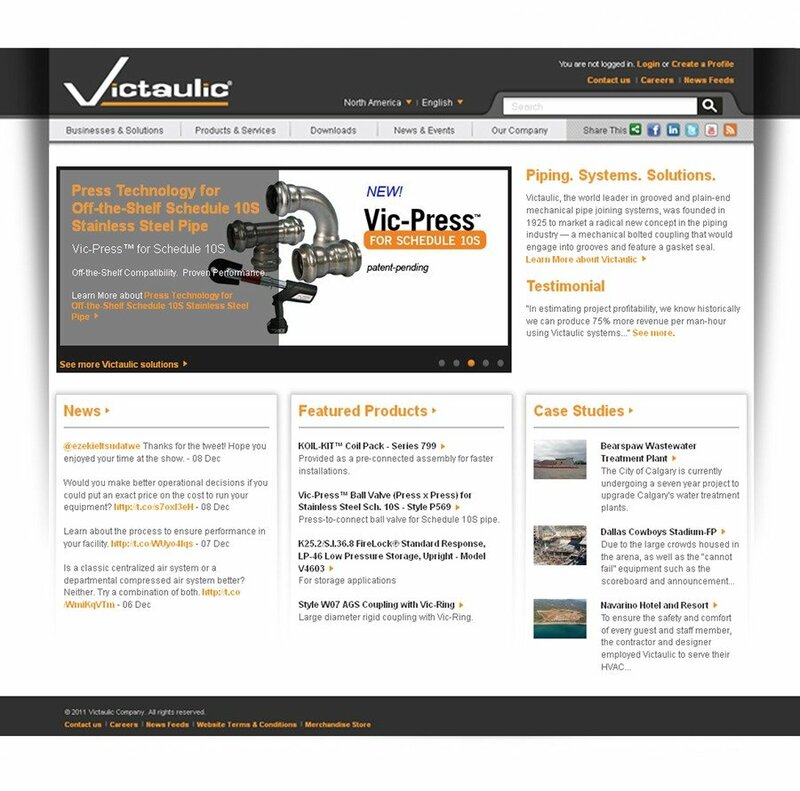 Victaulic, the global leader in the production of mechanical pipe joining and fire protection systems, announces today the launch of its redesigned website. The Victaulic website redesign will create a more pleasant user experience with optimized search functions, customer profile options and ease of access to product information, and will showcase Victaulic projects around the world. The new site offers easier download capabilities and more prominent display of vital information, while the secure, customized user profile will provide product and literature updates to Victaulic customers in real time. The user experience has been improved with the addition of enhanced search capabilities as well as information detailed by market and product, providing Victaulic customers with quick solutions to their pipe joining and fire protection needs. Victaulic engineering solutions and tools have also been optimized on the site to provide owners, engineers, contractors and industry bodies and associations with key insight into Victaulic solutions, including safety, reliability and productivity. “The new website was designed with great engagement from customers across the globe and across industries where we operate,” said Eric Luftig, director of marketing, communications and training with Victaulic. With improved server and hosting capabilities, customers will have quick, reliable and easy access to information about the products and services offered by Victaulic facilities located around the world. The new design integrates with social media and real time news, and can be accessed through mobile devices and popular tablet formats. Founded in 1925, Victaulic has its global headquarters located in Easton, Pennsylvania, United States. Victaulic has 11 international manufacturing facilities and 20 major distribution hubs, and employs more than 3,500 people worldwide. Victaulic develops products and services for some of the world’s most demanding markets, including oil, gas and chemical; mining; power generation; water and wastewater treatment; and military and marine systems; as well as commercial building and fire protection applications. Victaulic products are available in 103 countries. A mechanical joint is comprised of four elements: grooved pipe, the coupling housings, a pair of nuts and bolts and the rubber gasket ring. This gasket is pressure responsive and is encased by the coupling housing when it engages in the groove around the circumference of the pipe. 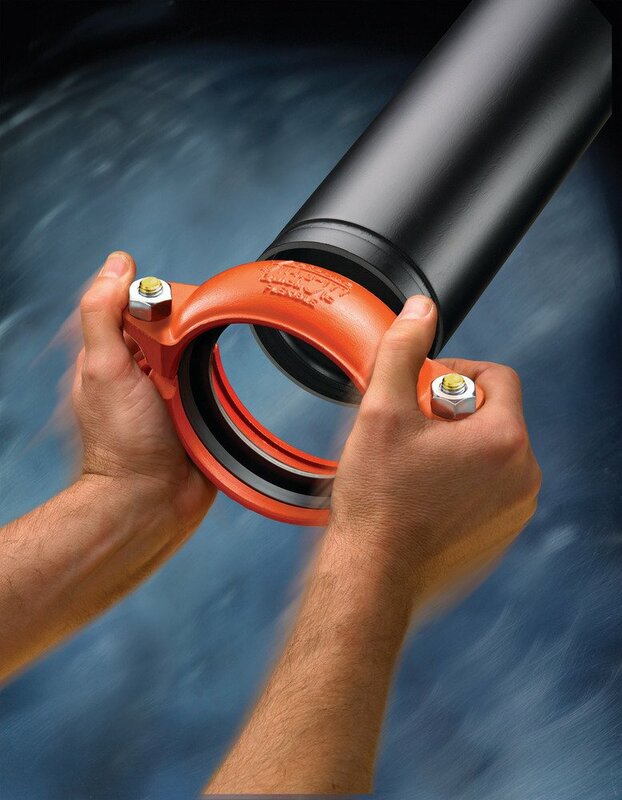 The gasket then creates a seal unified joint that is enhanced when the system is pressurized. The Victaulic system provides many mechanical design features that are useful in systems exposed to earthquake conditions. The flexibility of Victaulic flexible grooved-pipe couplings reduces the transmission of stresses through a piping system, while the gasket damps vibration. When flexibility is not desired, rigid couplings can be used. Both flexible and rigid couplings provide discontinuity at each joint, which helps minimize pipeline stresses generated during seismic movement.